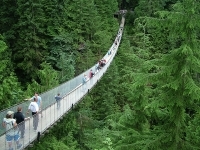 Built in 1889, the Capilano Suspension Bridge is one of the Vancouver's oldest and most popular tourist attractions. With plenty of activities and sights in the park, there are endless opportunities for park visitors. Stretching 450 feet (137m) across and perched 230 feet (70m) above the Capilano River, the bridge was originally made of cedar planks and hemp rope. But now, it's a more sturdy construction of reinforced steel and concrete; though still not for the faint-hearted. A recent addition to the park is the Treetops Adventure, where elevated suspension bridges allow visitors a spectacular view of the rainforest, while they walk above the forest floor between Douglas fir trees. Other attractions in the park include a story centre; a First Nations Cultural Centre where visitors can see carvers, weavers, and beaders at work; a large collection of First Nations Totem Poles; and guided tours of the rainforest. Admission includes all these sights and activities, and there are also several food options and a shop. Opening times: Varies according to season. Admission: $46 adults, $15 children, other concessions available.